It's the letter B this week. The first is a double B. And, no, that's not a bra size. It's this cute little sign. And now I have a quadruple letter B to share. I didn't make it, but I love, love, love it! 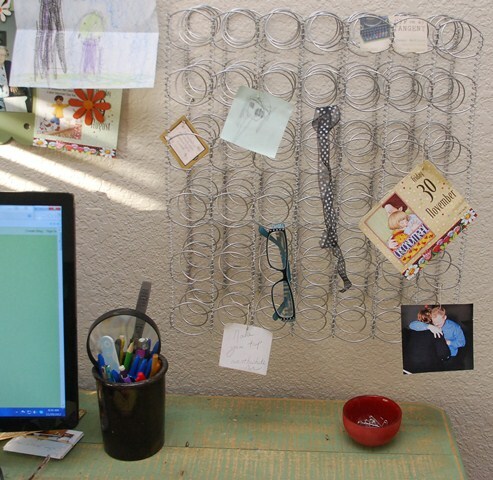 It's a Beautiful Bedspring Bulletin Board! I fasten things to it with safety pins! 6 B's for me this week! As for the little sign...no stencils. No stickers. No vinyl. Handpainted with my own layout. To visit other links to the letter "B", just click here. I love both of these! I like the subtlety of the forceful message in the sign. The bulletin board is an interesting way to re-purpose something. Pretty cool! A bedspring bulletin board! Who would have thought! I wonder why Etsy won't let you sell it? What a cool bulletin board? not allowed to sell? why would etsy not let you sell this? it's absolutely a kick! Love the sign and LOVE the bulletin board! What a great idea! That must be for an awfully small bed? A great set of B's! It always amazes me how creative people repurpose things that others might overlook...very clever! I love the bed springs! I must say that is the most unusual bulletin board I have ever seen! Unique to be sure! That's an awful lot of B's! 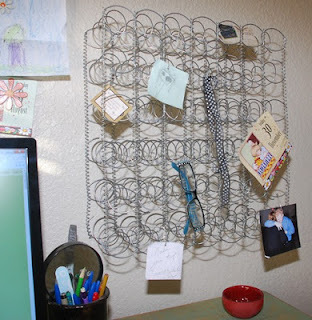 That is a very creative use for the bedsprings. That's so cool - kind of like you! That's such a neat bulletin board! You are just too, too clever. I'd never, in a million years, have thought of doing that with bed springs. I'd like to have your creativity even for half a day! That's a great idea. I wouldn't have thought of making that into a bulletin board but you have created something good. The bedspring idea is awesome....I wonder why Etsy won't allow them? Is Etsy bed spring racist? Those bed springs are getting a second chance! I Love it! What a terrific B post! Have a terrific weekend. Whoa..I like like this B sign! 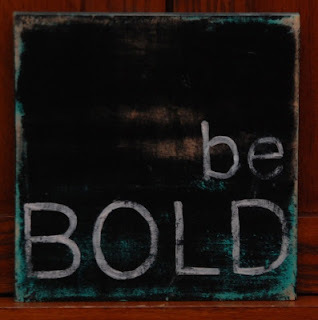 "Be Bold" Just perfect..
Hello Ms. Jenny!!! I am finally caught up on all my Christmas art orders, so am stopping by to say hello and see what wonderful signs you have shared! What a great BB sign and neat BBBboard! Why won't Etsy let you sell these? I hope to catch up with the class on this round! Hugs!! !